3-D Movies Fail The Reality Test : 13.7: Cosmos And Culture It is a myth that 3-D movies provide a greater sense of immersion than ordinary movies. The stereoscopic illusion of 3-D is just a cheap thrill. 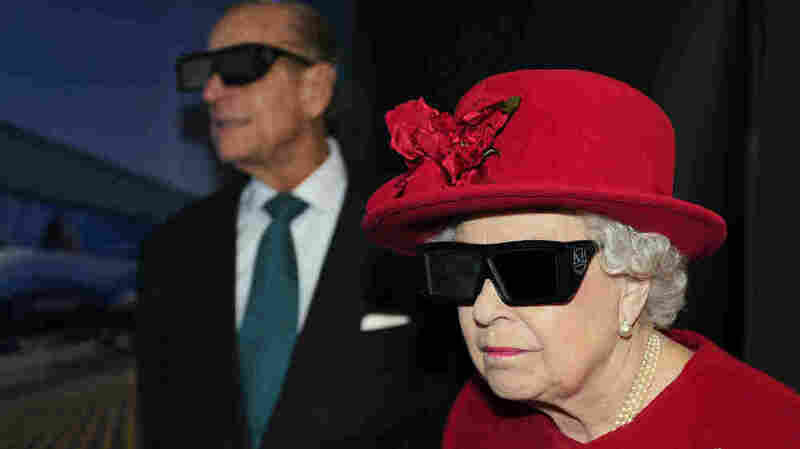 3-D glasses also present certain fashion challenges, as demonstrated here by Queen Elizabeth II and Prince Phillip during a visit to a university research center in England. A few months ago I wrote an essay on this blog about why 3-D movies were so bad. Some readers doubted my premise — that 3-D movies are so bad — and one reader wrote to me that he thought I was a crotchety old relic (which I'm not). But not everyone was negative. One man, a top executive at one of the leading 3-D conversion companies in Hollywood, sent me a note expressing his complete endorsement of everything I had written. "The bottom line," he wrote, "is those naysayers that have posted comments and accused you of being too old, or ignoring progress, are themselves cloaked in ignorance of how '3-D' is not, and never will be a representation of how we see things in real life. It is in fact a gimmick, a visual slight of hand that tends to distract from the story." For obvious reasons, he asked me to keep his identity a secret. The introduction of 3-D technology can't be compared to that of sound, or color, or even stereo, as people like to do. And for a simple reason. We use these technologies to show more, to extend what can be depicted. These technologies enable us to increase the amount of information we can represent or put to work in film. And this is the stuff of story-telling. Recall Marlon Brando's famous line, as Terry Malloy, in On the Waterfront, "I could have been a contendah!" You recall his facial expression, posture and movements, the line itself, the feeling with which it is delivered, but you also recall Brando's voice. You need sound to display the voice; you need sound for voice to be one of the elements in the composition making up the whole. Color similarly extends the working palette of the director and so extends what can be presented to an audience. We do not similarly extend the informational content of a movie when we add 3-D spatial effects. And for the simple reason that regular film already allows us to see the spatial relations between the actors and objects that make up the scene; 3-D doesn't change the palette. Consider: Right now I can see that my coffee table is nearer to me than the dining room table. And I can see that the window is off to the right. I can also see that the window is smaller than the doorway beside it. That is, I can visually experience the three-dimensional spatial relations among the things around me. I can also put these spatial relations in words. That's what I did in the previous paragraph. I used words to capture spatial relations such as near/far, left/right, above/below, bigger/smaller, and so on. And I can also depict spatial relations such as these. It is possible to make drawings, paintings, or photographs, in which the spatial relations of depicted elements can be readily perceived. None of this comes for free, by the way. Just as we need to learn the language and logic of spatial relations to describe them adequately in words, so we need to learn the methods of artificial perspective to make drawings that adequately depict spatiality. Similar issues confront the film maker; spatial and temporal coherence and continuity are the stuff of craft. We get a better sense of what 3-D is by comparing its introduction not to that of sound and color, but rather to that of monster-sized buckets of popcorn and soda, or with big reclining oversized theater seats. People love popcorn and business-class seats at the movies. These greatly enhance, or at least alter, the movie-going experience. But neither has anything to do with film. And so it is with 3-D. It makes a qualitative change in the movie-going experience, no doubt. But one that has about as much to do with the movie as the seat you are sitting on or the candy you are eating. It's a gimmick. A special effect. And boy, there is an effect. No doubt about it. Just how should we describe this effect? What sort of effect is it? We've already appreciated that it has nothing to do with the representation of spatial relations. 3-D does not stand to film as artificial perspective stands to painting. So what's going on? What is sometimes claimed is that 3-D gives you a greater sense of really being there, of immersion in the scene. But this is obviously not true. Remember, in normal life we don't usually experience the world the way we experience a 3D movie. When was the last time you ducked and exclaimed "whoa!" when someone walked past you? When was the last time you felt a sense of dizzying motion when you looked around? If 3-D were really an immersion experience, then it would be an experience of the normal, of the humdrum, of our familiar bodily location in the world where we find ourselves. But that is decidedly not what 3-D is like. 3-D is thrilling, surprising, and slightly upsetting (in a thrilling, surprising kind of way). What 3-D movies deliver is stereoscopic illusion — they manipulate where you focus and create a bizarre sense of pop-out and floating. They don't change the spatial relations you see; they change what it is like for you to experience those relations. They make them feel bizarre and they give you a thrill. For this reason, 3-D is not a step in the direction of virtual reality. Children love a feeling of bizarre pop-out and floating. Movie lovers shouldn't.